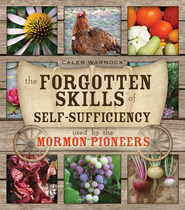 This latest volume in Caleb Warnock's popular Forgotten Skills series teaches you how to grow, harvest, and store your own herbs. Learn how to use them in natural remedies for safe, reliable healing, even when you can't get to a doctor. Let Caleb Warnock and master herbalist Kirsten Skirvin help you take charge of your health care and enjoy the natural benefits of herbal medicine without spending a fortune on artificial pills and supplements. This invaluable book will keep your whole family healthy for years to come!